Games Meet Metal: Yes Mr. Drake, clowns are scary. The game starts off with Nathan Drake waking up wounded on a train and it all goes to hell in a hand basket from there. Now I'm sure many of you have read reviews about this game that completely extol the virtues of the graphics and game play so I will do my best not to bore you with the details. But it has to be said that Uncharted 2 is easily one of the prettiest games I've played since well, ever. Naughty Dog did a fantastic job on the lighting effects and back ground animations. 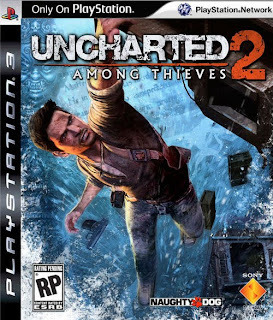 After having played through the single player campaign, I will say that Naughty Dog took to heart many of the complaints from the first Uncharted and created one of the best playing games of this console generation. The gun fights are spot on. The weapons each feel unique and as realistic as possible considering many of us will never get our hands on these tools of destruction. The fisticuffs have also been completely revamped. Drake now has unique fighting techniques based on which enemy type you are fighting. Naughty Dog also put forth a huge effort in making over the climbing system which was a bit counter intuitive in the first Uncharted. The voice acting in this game is beyond fantastic. The script was amazing, and to be honest, I enjoyed the cinemas to this game more than I enjoyed the last two Indiana Jones movies. I really enjoyed the unique quips between Drake and whomever he was partnered up with as well. It really brought together the cinematic experience. Which is a term I usually hate to partner up with my gaming, but in a way, that's exactly what this is. Now Naughty Dog went and slapped one hell of a multi-player component on to this game. Everything from unlockable skins to perks which enhance your player are included as well. There are also several multiplayer modes included in the package which will delight fans of this type of action. In conclusion, if you own a PS3 , you are doing yourself a disservice by not playing this game. It's easily the best game I've played all year and one of the finest examples of what consoles of this generation are capable of. I think I might get a PS3 in the near future. Lately I've been sitting on the sidelines salivating over the games that are coming out for it. Brutal Legend, Tekken 6 and God of War 3 are games I really want to try, and that's not to mention the games that are already out that I haven't had a chance to play yet. The Wii just isn't cutting it these days. I feel your pain there. Quite frankly the PS3 is the way to go these days. The gap between how many good games the XboX has and the PS3 is closing fast. You definitely won't regret the purchase one bit.